Does the Sony Alpha SLT-A37 really offers sufficient pro quality? Outwardly the Sony Alpha A37 camera mirrors a digital SLR in every way, complete with large handgrip and rugged feel build. Indeed it shares the same 'A' lens mount and APS-C sensor with the majority of Sony's Alpha DSLRs (such as the Sony Alpha 65, the Sony Alpha A55 and the Sony Alpha A33 apart from the most expensive full frame sensor models such as the Sony A99. But in fact this 'SLT' camera is a different beast. Enabling it to be handled like a compact system camera – in that it is as responsive when shooting video as it is stills – Sony has made the A37's internal mirror box mechanism translucent. This means that there isn't an awkward pause while it flips out of the way before video can be recorded, as happens with a standard DSLR. Here it simply doesn't need to move. Sony additionally claims this internal tweak makes for faster auto focusing: certainly we found the A37 lightning quick to respond to each half squeeze of its shutter release button. Early impressions are that this is a DSLR-styled camera that is as easy to pick up and start using as a bridge camera or fixed lens compact. 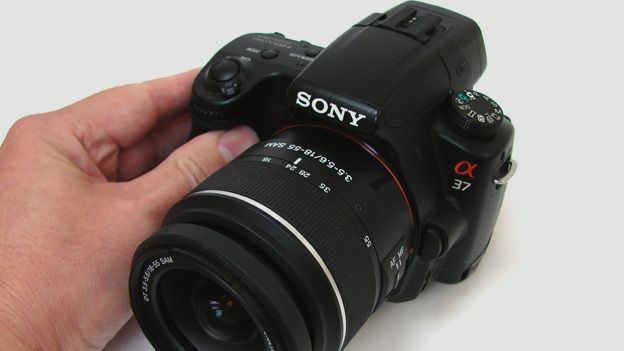 While that will doubtless appeal to amateurs liking the look and feel of a DSLR but not the perceived learning curve, so too will the Sony A37's price: a very fair £499.99, which includes the standard issue 18-55mm zoom lens we had on test. This proved a good jack-of-all-trades option, but if you already have Sony or older Konica Minolta lenses, then just the A37 body is an even more affordable £419. The 16.1 effective megapixel Sony SLT-A37 sports a serious looking matt black chassis with the same array of top plate controls we'd expect to find on any digital SLR. These include a 12-option shooting mode dial plus shutter release button handily encircled by a chunky on/off switch. Give this a flick and, provided we'd pre-chosen our desired settings, we were able to be taking our first shot within two seconds. The backplate controls are however where the A37 more closely resembles a bridge camera or compact, as the layout is sparser than most DSLRs: Sony sticks to the essentials of a multi-directional control pad, playback and delete buttons. A key aid to the taking of images is the electronic viewfinder or EVF provided here instead of the optical variety found on DSLRs. This incorporates an eye sensor just below, which activates the small screen as you bring an eye level with it. Of course stills and Full HD video can also be composed via the larger back screen LCD. The screen on the back of the A37 is not the usual fixed monitor; it's of the fold outwards and tilt up or down variety. Unlike various bridge cameras and the pricier Canon 650D DSLR, it cannot be flipped out parallel with the body, as on a camcorder, or turned to face the subject. But it still proves a useful feature; allowing for low or angle shooting without having to get knees grubby or hold the camera over the heads of a crowd and 'point and hope'. Because it can be angled, thereby enabling shots we wouldn't otherwise have attempted, we can put up with the slightly smaller than average 2.7-inch screen. Given that the resolution is a comparably modest 230,400 dots resolution, visibility is actually pretty good. If you prefer a more traditional style of operation and to use a viewfinder instead, there's of course also that 1.44 million-dot resolution EVF above. This offers a 100 per cent field of view – better than most optical viewfinders on budget DSLRs – making for the best of both worlds approach. The Sony SLT-A37 is powered by a NP-FW50 rechargeable lithium ion cell slotting into the base of the camera's handgrip; this sits alongside the dual-use SD/Sony Memory Stick slot, and is charged via a provided mains adapter and plug. Official CIPA measurements are 450 shots from a full charge if using the viewfinder and 500 shots if using LCD instead. We were shooting for a full day, taking over 250 images, and the battery indicator was still showing two thirds of the charge remaining; so a fair showing for its class and price in terms of power consumption. While it used to be the case that zoom lenses bundled with budget models were just there to get us started out of the box, the 18-55mm kit lens provided with the SLT-A37 is actually pretty good. It maintains detail and sharpness well into the corners. Add to this the fact that Sony's default colour settings tend to be punchy and well saturated, and immediately we were getting images straight from the camera visibly a step up from a snapshot and most other compact system cameras – with the possible exception of the £1000+ Sony NEX-7. The image as conveyed by the back screen and EVF is also pretty close to how the shots appeared on our desktop when downloaded. There are a couple of minor gripes: pixel fringing is sometimes evident where dark objects meet bright featureless skies, something which is true of most digital cameras, and the SLT-A37's 15-point auto focus sometimes struggled to catch up with subjects moving swiftly toward the camera – though a 7fps burst mode is there if required. Additionally, as this is a Sony model we get the choice of a couple of image aspect ratios: 3:2 or 16:9 rather than the usual digital camera ratio of 4:3. This means shots are automatically slightly elongated. If you hit the video record button to enable the 1920x1080 pixels Full HD clips, captured at up to 50fps and output at 25fps for a smooth rendering, shooting is automatically in 16:9 widescreen format, black bands cropping the LCD top and bottom to provide a more accurate representation of how it will look replayed on a flat panel TV. HDMI output is provided under a side flap for this. We'd recommend the 16.1 megapixel Sony SLT-A37 as a good option for anyone considering a step up from a humble snapper to a budget priced DSLR in the hope of a marked improvement in picture quality. This 'SLT' is more fluid to use than most DSLRs – we're not burdened down by a lot of controls we won't often use and all the essentials are here, recognisable from most compact cameras. Add in a screen that tilts for greater flexibility when composing shots, plus an EVF rather than optical viewfinder for those who prefer to hold a camera at eye level, and, for anyone who doesn't need the wider range of lens options offered by a Canon or Nikon system, the SLT-A37 is in many respects something of a best buy.